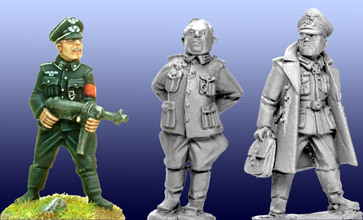 Anyone know of a suitable 28mm figure to represent Colonel Dankopf the German Officer captured by Kelly at the start of the film? Preferably with a briefcase. I saw the Foundry figure. Very nice, if only had glasses would be perfect. Head swap might be an option. In 28mm adding glasses should be an easy conversion. Might even be able to do it with clear superglue or resin?